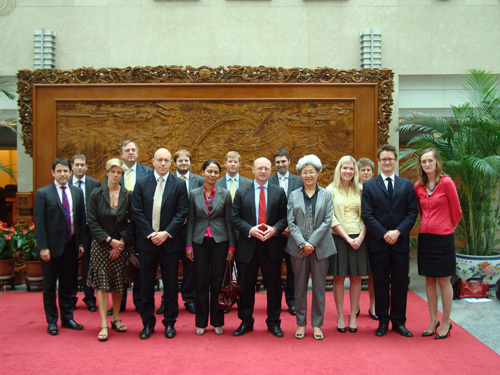 On May 24, 2011, Vice Foreign Minister Fu Ying met the delegation of British young politicians, which was led by Liam Dominic Byrne, British Labour Party' Shadow Secretary of State for Work and Pensions. The members of the delegation expressed their admiration for China's development achievements and their belief that China and the UK should increase understanding and deepen cooperation. Fu stressed that China's development path is suited to China's national conditions. China wishes to have dialogues with the west on an equal footing. The west and China should build mutual trust. She was asked to share her views on such issues as the relations between China and the west, the international role of China, China's political development, freedom of speech, Internet freedom as well as bilateral economic and trade cooperation.